CCG Manufacturing Ltd is a leading manufacturer of timber window and doors and is a member of the CCG Group, one of Scotland’s largest privately-owned construction and manufacturing companies. The firm operates out of two semi-automated facilities located at the Group headquarters in Cambuslang, Glasgow, capable of producing up to 20,000 units each per annum thanks to an innovative mix of technology and expert craftsmanship. Operating across a series of CNC production lines, CCG Manufacturing offers a consistent, high-quality finish produced at a rate that is 50% faster than window and door products made by hand. However, as means of further improving time and resource efficiency, CCG Manufacturing looked to Runners Sliding Systems and the ‘Multirail Auto’, a bespoke overhead conveyor system with a 62 meter continues loop that was installed within the robotic paint spraying line of the factory. The system has an operator panel at the beginning and end of the cycle, allowing staff to easily adjust speed and start/stop the process from either position. Timber frames and windows are loaded and then passed through the automated system to the flow coater chamber where they are sprayed with wood preserver and then fully dried prior to being offloaded. 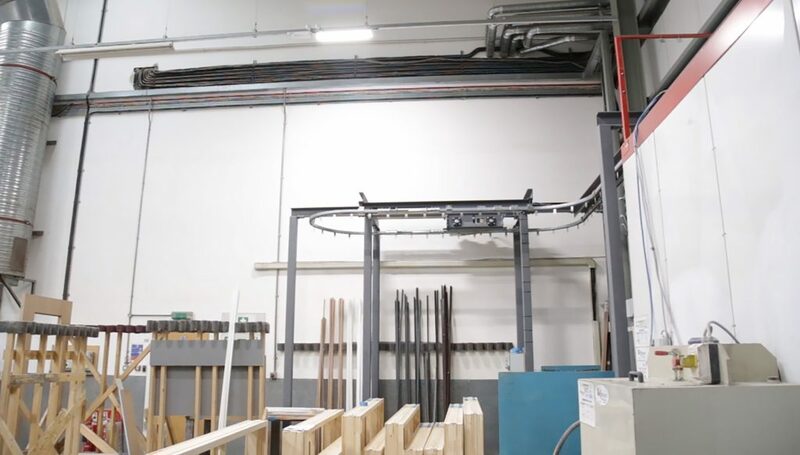 CCG Manufacturing Manager, John Paton, said: “Since its installation, the Multirail Auto has greatly assisted in improving the production process of our timber window and door products. In a busy factory, it was important to find the right product that could assist our team by achieving time savings and reducing man-handling on the factory floor. Multirail is also available as a non-automated solution, these are often chosen by smaller operations across various sectors. Daniel Wells, Sales Director at Runners Sliding Systems commented “We sell Multirail and Multirail Auto overhead track systems to a wide range of sectors across the country, our customers vary from small workshops to large factories, Multirail solutions are scalable to suit most space and production requirements”.